When in doubt about what to write, pick up a meme! This one comes from The Horse Is Not Black. 1. What are your summer goals? 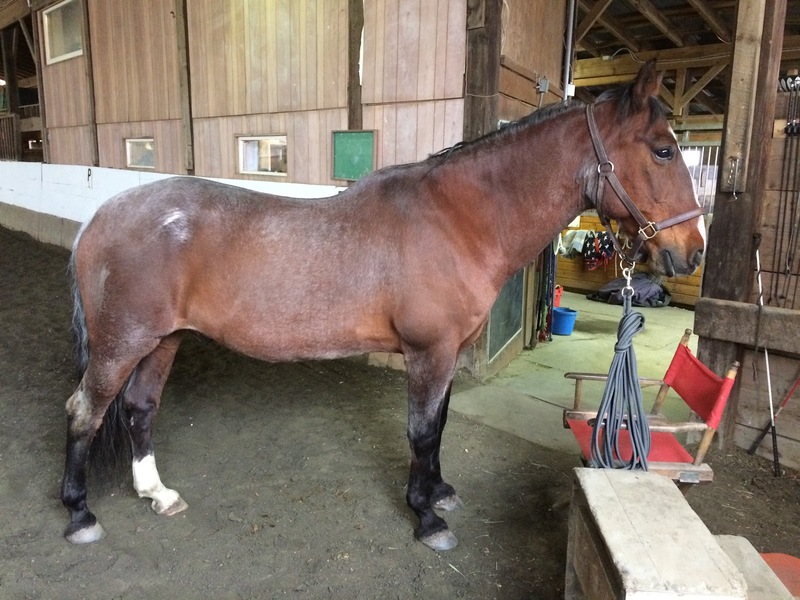 I’d like to continue our slow-but-steady progress in dressage; in particular, in accessing his hind end and working on relaxing instead of bracing through transitions. I’d also like to solve his assholery in the outdoor. I’ll have to get it on video at some point so you all really understand what I mean, but I’d like it to stop. I don’t mind spicey, I mind idiocy. 2. Do you have any tips or tricks for fly control? Sigh. No. I want to try that new EcoVet stuff that people are raving about, just to see how it goes. Tristan wears a fly mask & fly sheet all summer but less to actually keep out flies than to keep him from other irritants. His eyes blow up if you look at them sideways and he has some kind of allergy that triggers hives. The fly gear helps with that, but actual flies are probably here to stay. He does need a new fly sheet, though, since his old one (admittedly picked up for $15 on clearance 10 years ago) is giving him rubs. So that’s on the list for this summer. 3. How often do you bathe your horse? I’m really not sure. That’s actually a good question. Once a month, maybe? He gets rinsed off whenever he sweats, so I don’t know if that counts. I do hope to give him more regular baths this summer. he hates baths so much. 4. Do you have any upcoming travel plans? Equine or otherwise? It’s a summer of family weddings, so we have three trips planned for that. It’s also a travel summer for work, both to research a new exhibit and to do outreach work and speak on some of our past research topics. It’s rare that work takes me out of state, though. Safe to say I’ll be on the road at least once a week until it starts snowing. 5. What is your favorite way to beat the heat? I am a thin-blooded lizard person and I rarely feel the need to beat the heat. (Also, it’s Vermont; we’ll have a week or two where it hits the 90s and that’s as hot as it gets.) If I am really desperate there are rooms in our house that get better ventilation, and I read or do something to take my mind off it. 6. Do you do anything to prevent your horse from sunbleaching? 7. How hot is too hot for you to ride? Those weeks where it hits the 90s I’ll ease off. Having the indoor helps – it’s markedly cooler in there due to shade and cross-ventilation. It’s really rare for me to choose not to ride because of the heat. I have more nuanced limits for cold. 8. How important is sun protection for you riding or just in general? Less than it should be, for sure. There have been times in my life when I’ve been neurotic about sunscreen, but I’ve slacked on that in the last few years. I rarely burn (my skin has more olive tones) so I’ve gotten lazy. 9. Have you ever gone swimming with your horse? Hahahahahaha. 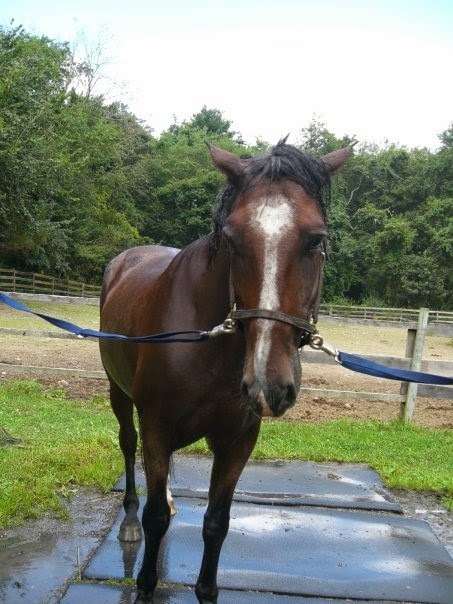 I once tried to get Tristan to the edge of a small pond and it resulted in a 45 minute bucking & rearing fit. Desert mustangs Do Not Do Water. We’ve ridden through water jumps after much coaxing and weeks of firm cross-country schooling. That’s as close as it gets. 10. And because shopping is always on my mind, what’s on your summer wish list? New tall boots! Finally. Probably also some new sunshirts, I have a bunch of house-related wish list items as well, and some personal ones, like a new computer. Nice! You've got some ambitious showing goals! You know. I never thought about how a desert horse would handle copious amounts of water. Explains the hate of bathing, I suppose!